The Ethnology exhibition in the United States National Museum displayed dioramas of Native Americans with the George Catlin Indian paintings on the walls in the background. 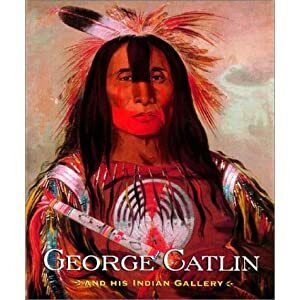 George Catlin (1796-1872) journeyed west five times in the 1830s to paint the Plains Indians and their way of life. Convinced that westward expansion spelled certain disaster for native peoples, he viewed his Indian Gallery as a way "to rescue from oblivion their primitive looks and customs." Catlin was the first artist to record the Plains Indians in their own territories. He admired them as the embodiment of the Enlightenment ideal of "natural man," living in harmony with nature. But the more than 500 paintings in the Indian Gallery also reveal the fateful encounter of two different cultures in a frontier region undergoing dramatic transformation. When Catlin first traveled west in 1830, the United States Congress had just passed the Indian Removal Act, requiring Indians in the Southeast to resettle west of the Mississippi River. This vast forced migration—as well as smallpox epidemics and continuing incursions from trappers, miners, explorers, and settlers—created pressures on Indian cultures to adapt or perish. Seeing the devastation of many tribes, Catlin came to regard the frontier as a region of corruption. He portrayed the nobility of these still-sovereign peoples, but he was aware that he painted in sovereignty's twilight. By the late 1830s and 1840s, Catlin began displaying the Indian Gallery in eastern capitals and in Europe, an advocate for the Indian way of life. Yet the challenge of keeping his collection together and making ends meet led him to questionable strategies. He courted audiences by presenting real Indians enacting war dances. In effect, Catlin created the first Wild West show, with all its compromising sensationalism and exploitation.